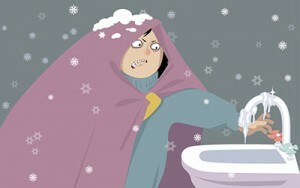 The chill of winter can wreak havoc on the pipes in your home. If ice is allowed to form inside your pipes, it will halt the flow of water to your taps and appliances, and if left unchecked, they will eventually burst. The ensuing flooding can result in significant and costly damage to your home and belongings. It’s for this reason that we have prepared some simple prevention and thawing tips. It stands to reason that pipes that run through the coldest parts of your home are the most likely to freeze. If you have plumbing located in your garage or attic, it’s the most susceptible to the cold. Make sure to keep your garage door closed as much as possible as well as your attic windows. This will help to retain the heat and keep cold air from coming in. If freezing occurs regularly, you may want to consider adding more insulation to the area or having the pipes rerouted to other parts of your home. One way to warm up your pipes is to let the hot water run for a little while. This will help to thaw any buildup and delay the formation of ice due to the cold. 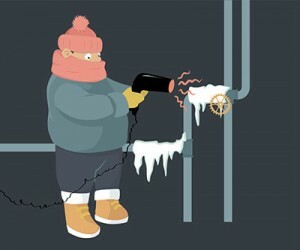 While this strategy mainly affects hot water pipes, letting cold water run can also be useful since water in motion is less likely to freeze than standing water. Furthermore, moving water that is nearing the freezing point away from the coldest section of your plumbing will slow down the process. If freezing pipes is a recurring problem, you can wrap them with heating tape. Armed with an electrical filament embedded inside, this tape provides heat directly to the pipe when plugged in. Be sure to follow the manufacturer’s installation instructions. If you’re looking for an alternative that won’t consume electricity, wrapping your pipes with foam insulation may be sufficient to prevent freezing. Simply slip on the insulation and remove the adhesive backing to seal the insulation around the pipe. If you’re faced with a frozen pipe, it’s important to address the issue right away before it bursts and causes extensive damage. If you know where the ice blockage is located, using a hair dryer on the heat setting is a good way to heat up the pipe and melt the ice inside. Alternatively, you can try adding space heaters to the area or use a heating lamp. If the blockage persists, you’ll probably want to call a plumber for some expert assistance. In the meantime, you may want to shut off the water supply to your home to limit the amount of flooding that would occur if the pipe does burst. Next, you can open some taps inside the house to help relieve some built-up pressure inside the pipes and allow space for the ice to expand. If you have issues with freezing pipes in your Annapolis area home, call 410-268-7191 to speak with the experts at Heidler Plumbing.